I went down to Turlock CA. recently to the Rock and Gem Show along with my friend, Gene Stewart, and his daughter, Gena. I rode down with Gene to help with his booth selling Star Garnets and cracking geodes. 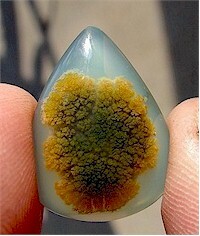 In my wanderings, I happen upon a dealer that had a bunch of slabs that looked like Chrysoprase with these amazing dendrites in the centers. It had the Chrysoprase color, but the outside rind was all wrong. Plus, it had a dendrite/moss plume smack in the middle. After looking at it a little longer, it looked like common Snake Skin Agate, but I knew of no Snake Skin that has this color? So sucking my pride in...I asked the dealer, what it was. He said, " It's Snake Skin Agate that has been dyed". Hmm... OK that makes sense...but what about the dendrite in the middle? No snake has that?? He told me that a Doctor made these slabs back in the 60's. He discovered how to make the dendrite though some process no one really does anymore. I showed Gene the slabs and he remembered seeing it years ago but really didn't remember the name but did know it was created. I bought all 114 slabs. The dealer said he didn't know how he did it exactly, but he did give me a few clues. One, he said the color comes from copper sulfate, so I did a little surfing and found an article written by Dr. George W. Fischer. "Chemically Induced Inclusions - Dendrites Moss Plume". Very well written (unlike what I'm doing now) and detailed about, how he discovered it and the process he went through perfecting it. After coming back home, I took one of the slabs and made the cab you see in the picture above. Snake Skin is very common out here in Idaho/Oregon and has no real value other than the outside looks like...well...snake skin. The agate is normally semi clear pasty white. BUT, the finish is super GLASSSS!!! It's about the only redeeming value Snake has. I then decided to find out if anyone had seen and would know what I had. A good way was to ask my customers who were on my Future Sales Emailing List and have fun at the same time. I decided on a contest to create interest at least. Before having this contest, I showed my cab to a friend of mine. He was all over it with- "This is beautiful! Wow great moss plume, beautiful color!". I asked him to guess what it was and he didn't know. When I told him, he was really surprised. To my surprise, he looked at it as if it had the plague. I said ,"What the hell! you were practically drooling over it and now you act like you don't like it!" I said "It's not like it's glass. It's agate!" He said, "but it's made." I looked at him and said, "Who the hell cares, it beautiful! Look at the finish. It's outstanding!" I go on, "I'll bet when I post it, everyone is going to love it ." I did a test a few days after showing my friend, with my Mother-In Law. I really like her, because she has great taste and always gets the finer things in life. She's also a great gage as to what a non-collector/non-rock hound buyer will like and buy. She looked at it... and for the first time in all the 25 years I've known her, she said an expletive: "*$#@! What is that! It's beautiful !" I told her what it was and asked her did it bother her that it was created? She said exactly what I said to my friend. "Who cares! I love it...it's agate isn't it!" Of course, I'll need to make one for her now...but that's O.K. She's wears my stuff and she's great PR.